This is a recipe that I actually made in August, and wrote the post at that time too, but with other recipes and ideas crowding this one out, it's been sitting in my draft posts, just waiting. 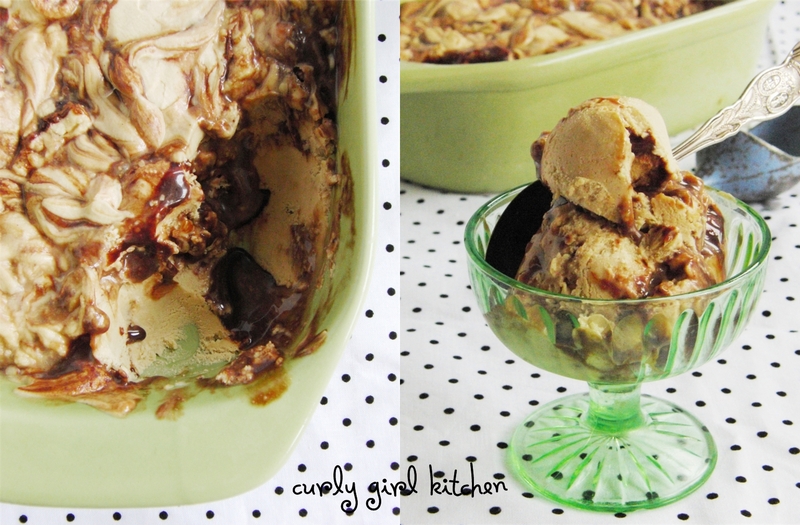 The night I made this ice cream was one of those moments where the it's-time-to-make-more-ice-cream bug bit me. It found me on the couch, watching TV with Jamie, grabbed hold of me and wouldn't let go. But there was very little in the fridge that I thought could even become ice cream, and you know how I hate to go to the store for ingredients when I want to make something right away. Hoping Jamie would have an idea, I said, what kind of ice cream do you want? His answer: Something with lots of chocolate. And caramel. And more chocolate and caramel. When I spied a jar of creamy peanut butter and a package of low-fat cream cheese, I thought I might be able to come up with something. 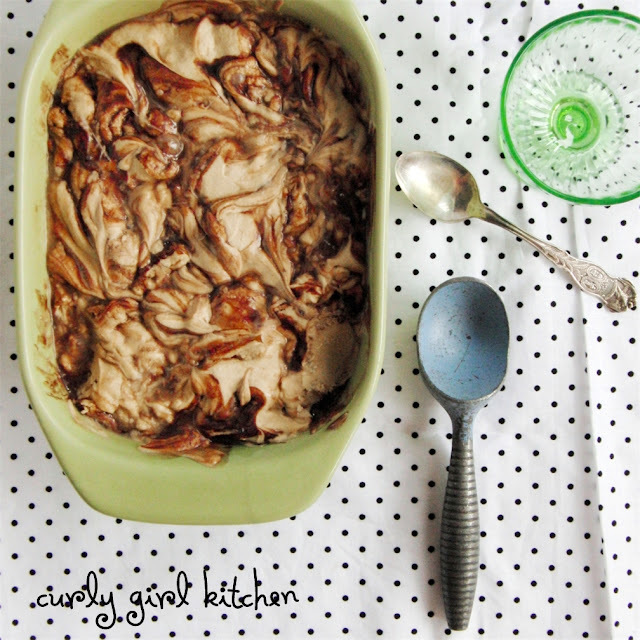 How about peanut butter ice cream, swirled with chocolate and caramel? I asked. And intense this ice cream is. It tastes intensely naughty, although it has far less cream then many other ice creams I've made, so the creaminess is from the peanut butter. And the best part is, this recipe doesn't require any custard cooking or ice cream maker churning. It's very thick after being mixed, a combination of cream, light cream cheese, peanut butter and milk. A little powdered sugar for sweetness, although not too much, since the chocolate and caramel would add more sweetness. A touch of vanilla and salt, of course. Intensely naughty indeed. Someone needs to come get this out of my freezer. The caramel sauce and chocolate syrup will need to be cool, but pourable. If too thick from being refrigerated, warm gently in the microwave at 50% power, then let sit at room temperature. For the ice cream, place the cream cheese and whipping cream in the bowl of your stand mixer. Mix on low with the whisk attachment to combine, then whip on medium for 1-2 minutes until thick and smooth. Add the rest of the ingredients, mixing until smooth and creamy. Transfer to a container and refrigerate for 2 hours, or overnight. Place the dish you are going to make the ice cream in (such as a ceramic casserole dish) in the freezer while the ice cream is chilling in the refrigerator. 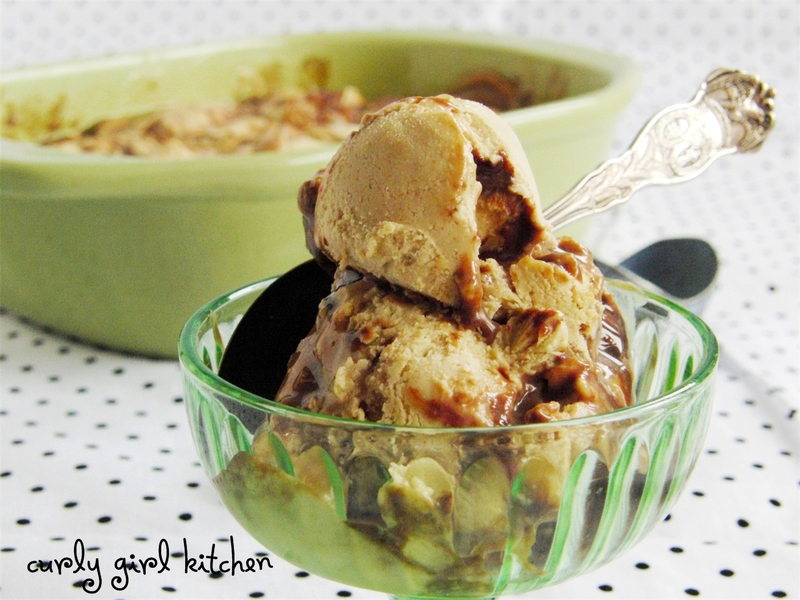 When the mix and the dish are chilled, spoon half the peanut butter mixture into the dish. Drizzle with half the chocolate sauce and half the caramel. Repeat with the rest of the ice cream, chocolate and caramel. 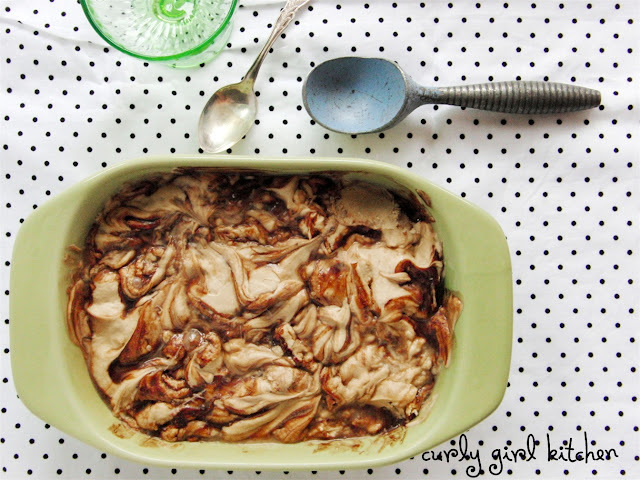 Use a spoon to gently swirl it together, but don't overdo it. You want visible streaks of the separate elements, not a homogeneous mixture. Wrap tightly in plastic and freeze until firm, about 4-6 hours. Yields about 1 1/2 quarts.